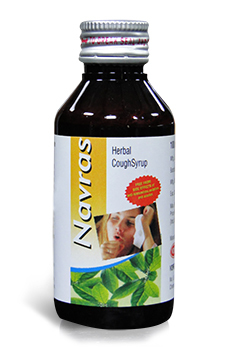 Navras syrup is excellent for treating cough symptoms without the side effects of drowsiness or sedation. The anti-inflammatory activity of this formula effectively reduces inflammatory conditions in the respiratory tract. It dissolves congested phlegm easily and expels them from the lungs. It forms a soothing film over the respiratory tract and relieves any burning sensations within the airways caused by recurrent coughing. 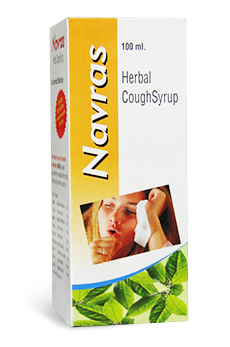 Navras syrup is an excellent for cough syrup without any side effects of drowsiness or sedation. The anti-inflammatory activity of this formula reduces inflammatory conditions in the respiratory tract. It dissolves congested phlegm easily and expels them from the lungs. It forms a soothing film over the respiratory tract and relieves any burning sensations within the airways caused by recurrent coughing. Navras syrup also improves immunity of the body against respiratory tract allergies. It is suitable for children and also safe to use while driving vehicles or operating machinery. Take 5 to 10 ml twice daily after meals or as directed by your physician. Please keep in mind that it is prudent to consult a physician for the correct dosage depending on your current condition. Nutrition may not be optimal, consider taking Spirupac Capsules in conjunction. Purpose: Natural anti-histamine commonly referred to as the Thai Eggplant, Solanum xanthocarpum contains active ingredients that are highly beneficial for treating common cold and cough symptoms. Solanum xanthocarpum stabilizes mast cell activity, which play a role in allergic reactions. It also provides natural anti-histamine and anti-inflammatory properties. In effect, active ingredients of the herb controls respiratory tract allergies by blocking histamine receptors and inhibiting release of inflammatory mediators from mast cells. The herb is effective in treating bronchial asthma and upper respiratory infections due to its ability to reduce the release of histamines. Purpose: Effective anti-oxidant and anti-tussive herb Tulasi or holy basil is widely used in ayurvedic medicine for the treatment of respiratory diseases. Tulsi has a beneficial impact on the central nervous system and is able to alleviate stress and anxiety. Its anti-tussive properties reduce cough. It also provides immunomodulatory, antifungal, antimicrobial, diaphoretic properties, and removes toxins from the body. Purpose: Mucoprotective herb Glycirrhiza glabra is commonly called licorice, fennel seeds or aniseed. It acts as an emollient and prevents irritation in the throat by forming a soothing film over the mucus membrane in the throat. Liquorice constituents exhibit antibacterial, antiviral, expectorant and anti-inflammatory properties. Liquorice extracts are also able to dissolve and expel congested phlegm from the chest thereby relieving tightness in the chest. Purpose: An antioxidant herb for controlling respiratory tract inflammation Turmeric is highly regarded in ayurvedic medicine for its anti-inflammatory, antioxidant, anti-tumour, antibacterial, and antiviral properties. Due to the antispasmodic, anti-inflammatory and anti-bacterial effects of its active ingredient, curcumin, turmeric is especially helpful in controlling respiratory tract infections and relieving cough systems. Indian J Physiol Pharmacol 2005; 49 (2) : 243–245 Study of anti-tussive activity of Ocimum sanctum Linn. Yasmeen Jahan* and H.H. Siddiqui, Study of antitussive potential of Glycyrrhiza glabra and Adhatoda vasica using a cough model induced by sulphur dioxide gas in mice. Is there any toxicity concern shown in the study of Navras Syrup? Some herbal chemicals can induce mutations and can also be responsible for future mutations. Mutations are responsible for abnormal cell growth that could lead to toxicity and cancer. To test that there is no such effect, Navras Syrup has been subjected to comprehensive research study. Using analysis known as 'bacterial reverse mutation' method, Navras Syrup has been tested for mutagenicity, toxicity and carcinogenicity. The study showed that there was no significant finding for such toxicity.